^ Name and Insignia of Hawaii - State Flag. Hawaii State Library. 2006-03-01 [2007-10-25]. （原始内容存档于2007-05-11）. 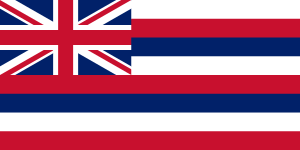 ^ 3.0 3.1 Name and Insignia of Hawaii - Governor's Flag. Hawaii State Library. 2006-03-01 [2007-10-25]. （原始内容存档于2007-05-11）. ^ Hawaiian Flag Day Proclamation. [2007-10-26]. （原始内容存档于2009-10-29）.